Early on in the Talos development ignition was by two flares in the combustor section. This was APL's solution. 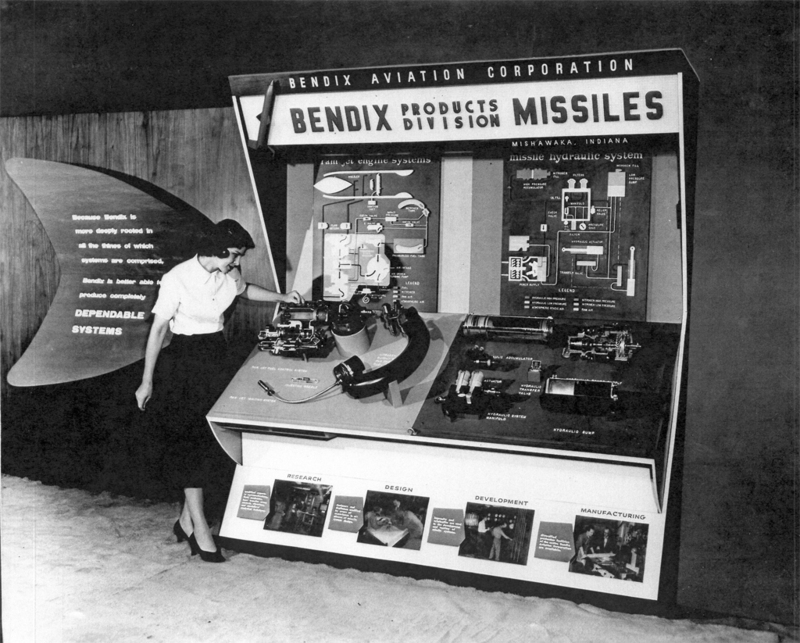 As the APL/Bendix team became closer, Bendix suggested using the regular aircraft ignition system used in WWII aircraft and the newer jet engine fighters. 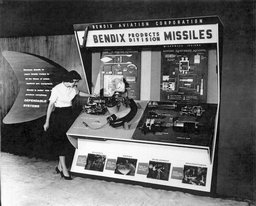 The Bendix "Scintilla Division" in Sydney, New York, made most aircraft engine ignition systems in WWII and was the Bendix Corporation's "Aircraft Engine Ignition System" division. So the Scintilla Division came up with the ignition system for Talos. 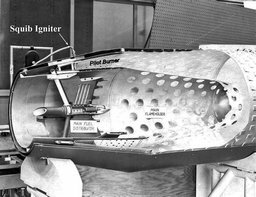 It was mostly like that in the jet fighters of that day - except Talos had one spark plug and WWII engines had two plugs per cylinder. As you can imagine when dealing with engine ignition within milliseconds after Talos/booster separation there were many possible reasons for delays. The actual fuel/air ratio at that instant at the spark plug, energy in that first spark, spark rate, booster/ Talos separation malfunction, combustible fuel/air ratio for JP-5 fuel, energy requirements, and on and on. We collected all the ignition delay data we had - but it was all from White Sands launchings so we were not sure that our reasonably good results applied to sea launch. We asked the Scintilla Division if they could increase the energy per spark. They said not without re-design, and we did not want that. We decided to explore JP-5 fuel/air ratio ignition limits and spark energy requirements in our lab. After setting off the CARDOX fire suppression system and almost losing one man, we quit that. It then occurred to me that one of the world's experts on that subject might be the U.S. Bureau of Mines in Pittsburgh, Pennsylvania. 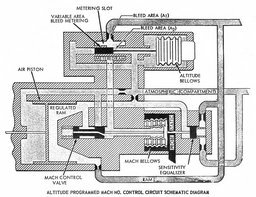 I contacted them and they sent back ignition requirements on every fuel imaginable, plus the opinion that with JP-5 we were a bit on the marginal side. This led us to believe we needed something in addition to the ignition unit we had and we got in touch with a company in California that was into explosive devices. 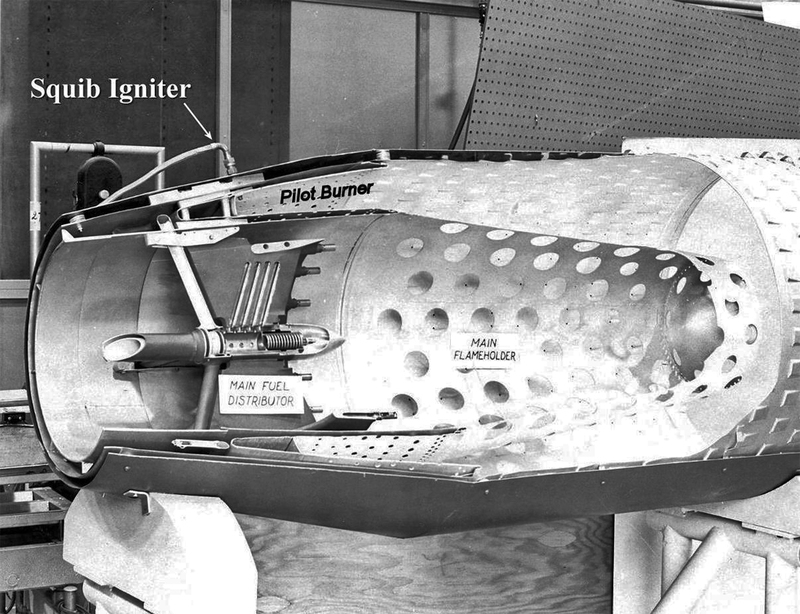 They came up with the Hot Gas Igniter (HGI) and between us we came up with a final package that could be retro-fitted into Talos in addition to the regular installed ignition unit. So we had a double ignition source. Also we wanted a fix that could be implemented in the field at depots and ships [More on this later]. Our group was responsible for liaison with Allegheny Ballistics Laboratory (ABL) who made the booster. I don't remember where ABL was in Maryland - I never went there. We had one man in our group that did all the contract work. Our interest was in the separation ring (booster to Talos), and getting a perfect separation. There were a lot of detail design issues in this booster to Talos connection. Out of this we came up with the booster release activator. You can imagine what we called it: BRA. In the earlier design APL had used an explosive device which we thought we could improve on. It was entirely pneumatic. It had a piston with ram pressure applied to both sides during boost. Upon booster burnout a "G" activated valve would open one side of the piston to atmospheric pressure and this would pull the release pin on the ring clamping the booster to the Talos tail ring. PS: Our BRA was on all production Talos, but it took a lot of convincing of APL men that it was reliable. Our coordination with ABL was a lot about the separation issue. The liaison man in our group, Bob Beckett, was a pilot and had his own plane. Instead of riding the B&O railroad to ABL (which was nearby), he wanted to fly his plane down there. You can imagine what corporation liability issues this raised. The Bendix attorneys imagined about every kind of disaster you can think of. I was inclined to give up on the idea, but still thought it made pretty good sense. The upshot is that the attorneys finally got enough language in some sort of document that released Bendix from any responsibility and our man got to fly his plane on his trips to ABL. Here is a picture of a full size Talos remains after flight at White Sands. 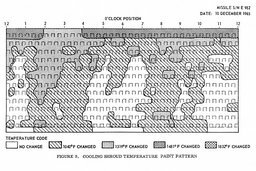 This was when we were having a hot area develop in the cooling shroud in the combustor and burning through the outer structure -causing flight failure. We always went into the desert and recovered remains and hauled back to the "bone yard" for examination. "We were gathered to select which combustor modification to test next. The tests were being conducted at the Navy's Ordnance Aerophysics Laboratory (OAL) in Dangerfield, Texas. 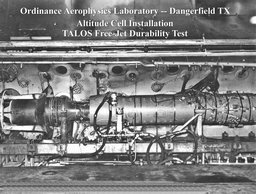 The test objective was to identify a combustor modification for the Talos ramjet missile that would eliminate tailpipe burn-through that had occurred at certain flight conditions." 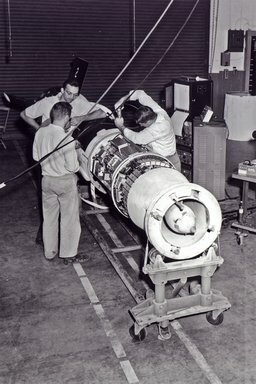 "Included in the discussion were Dr. Wilbur Goss, Director and father of the Talos missile program at Johns Hopkins University Applied Physics Laboratory, Bill Shippen Chief Talos Propulsion Engineer, his two senior engineers from APL, Jim Kiersey and Jim Hargrave, the OAL test conductors, and me, John Rejeske, a very junior Talos Propulsion Engineer." "Dr. Goss, chalk in hand, declared that he who controlled the chalk controlled the meeting - and he did! Dr. Goss favored test model A. The rest of us favored model B. Model A it was." "The test results were not encouraging. At a gathering of the same gang the next morning, Dr. Goss - I think he kept the chalk in his pocket - suggested we test model B. Being the junior engineer and senior wiseass, I remarked to Dr. Goss that he apparently changed his mind. He looked at me firmly but gently and said 'No, I did not. The facts today are quite different from the facts yesterday morning so one would expect a different conclusion. So no, I did not change my mind.'" "A very wise life lesson from Dr. Wilbur Goss." We had an unexplained Talos missile flight test failure at White Sands. I flew out to El Paso to go out to the proving ground "bone yard" to examine the wreckage. 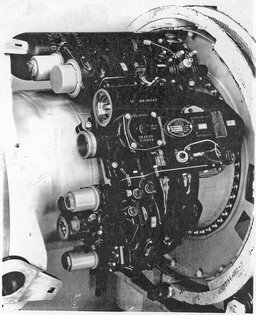 Here is the story: in the engine section there were two fuel injection arrays - the pilot injector nozzle ring and the main nozzle ring. 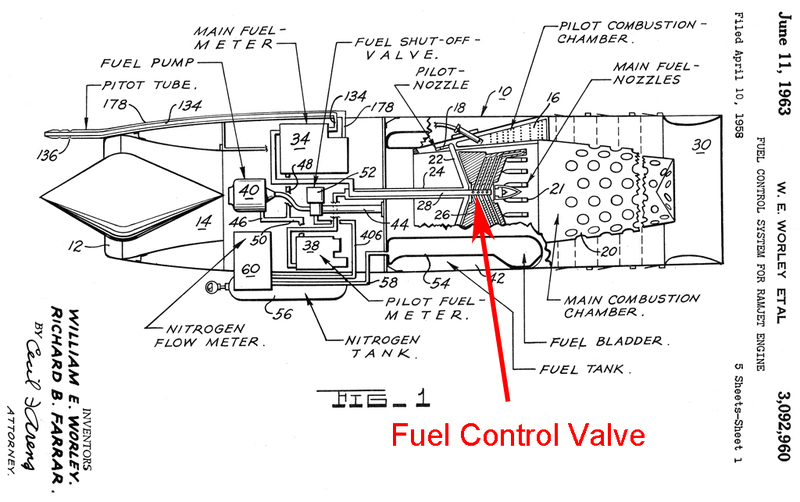 Pilot flow was continuous and varied only to maintain the desired fuel/air ratio under all altitudes and to ensure that the combustor always had a pilot light - so to speak. 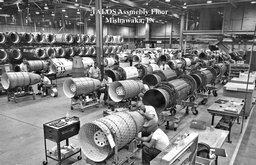 The main flow through another set of injector nozzles was varied to maintain the design Talos Mach number as altitudes and maneuvers varied. 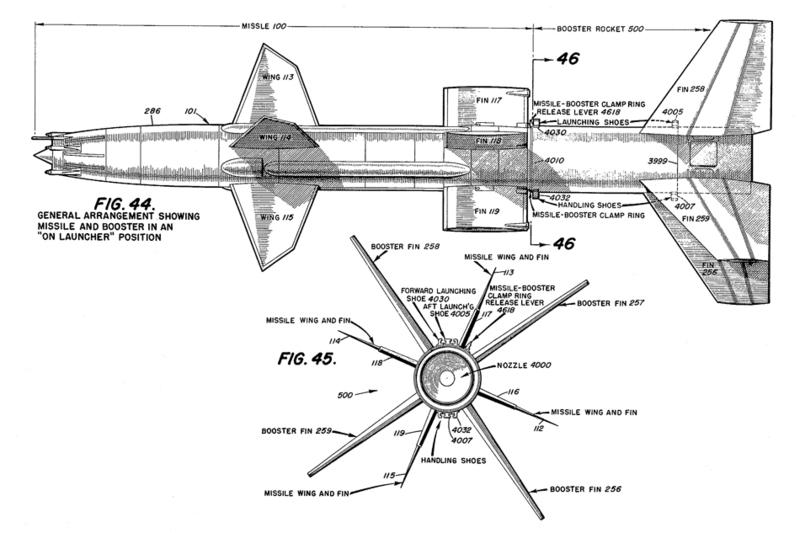 We had all kinds of telemetering on the missile - fuel flows, altitude, Mach number, etc., etc. - and their flight record rolls were miles long. We really enjoyed pouring over these records, even on Saturdays and Sundays. In this case, main fuel flow abruptly stopped - no tail off - no slowdown, just stopped like cut off with a knife. 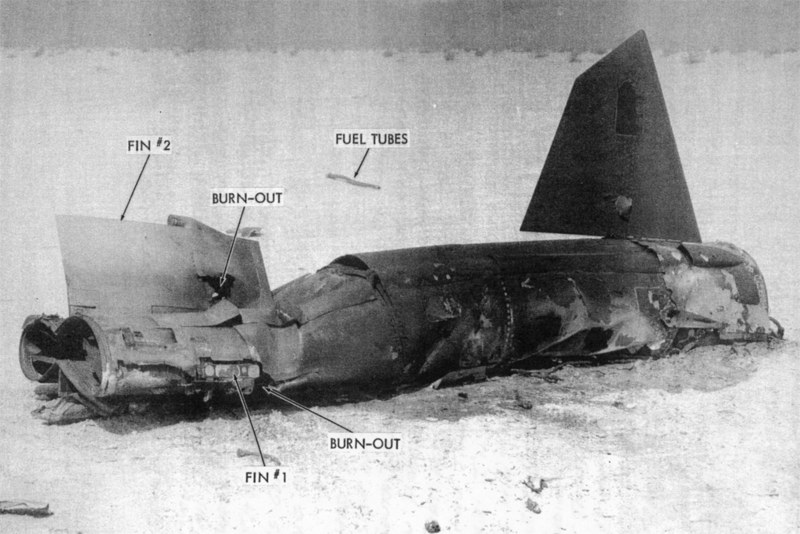 The missile of course slowed down and wound up as a wreck in the desert. Every other telemetered item was perfectly OK. We could not find anything that explained this - so, to the "bone yard" at White Sands I went. On the plane trip down to El Paso I spent the entire trip pouring over schematics and drawings and finally hit upon a possible but almost unbelievable cause. In the center of the main fuel flow injector assembly was a multi-orifice valve assembly that distributed fuel equally to 12 injection points - under all conditions of low or high fuel flows. To ensure that the 12 valve ports had equal open areas as the valve moved between high and low fuel flows, the valve was guided by a fixed pin located in the valve housing. 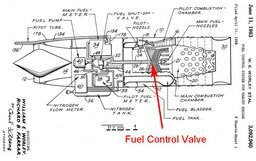 After much study of the drawings (I'm enclosing one from the patent) I concluded that the only possible way that main fuel flow could abruptly stop was if the distributor valve just shut down - and that could not happen unless the guide pin was missing - and I didn't see how that could happen. Anyway, I concluded that was the only possible explanation - and the "bone yard" exam showed exactly that. There was no guide pin in the valve assembly - and the valve with 12 ports had rotated and closed all 12 ports instantly - shutting off all fuel flow to the main combustion chamber. What is that "old story" - for "lack of a nail," the whole house collapsed. We fixed the problem with some redesign of the guide pin and a major upgrade in "inspection" procedures and quality control. From my collection of schematics I have nothing that details that main fuel distributor assembly - and it was crucial to proper engine function. In looking back - I'm kind of surprised that we never focused on that. 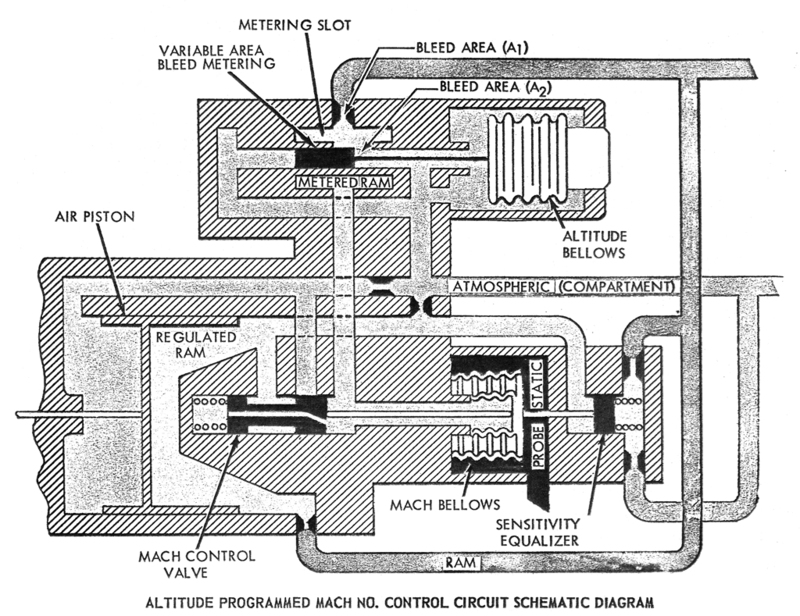 In the original Talos Mach number control the moving parts in the hardware just happened to be in line with the fore to aft center-line of Talos. 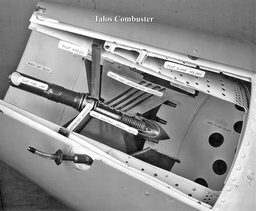 So as Talos slowed down, the deceleration G's tended to delay the signal to increase more fuel to the main fuel injectors in the combustor. As the main fuel came on and Talos accelerated, the acceleration G's tended to delay the signal to decrease main fuel flow. So Talos wandered above and below the desired control Mach number. The frequency wasn't too bad or the excursions too bad, but we noticed it on the study of flight records. So much for our seat of the pants engineering! 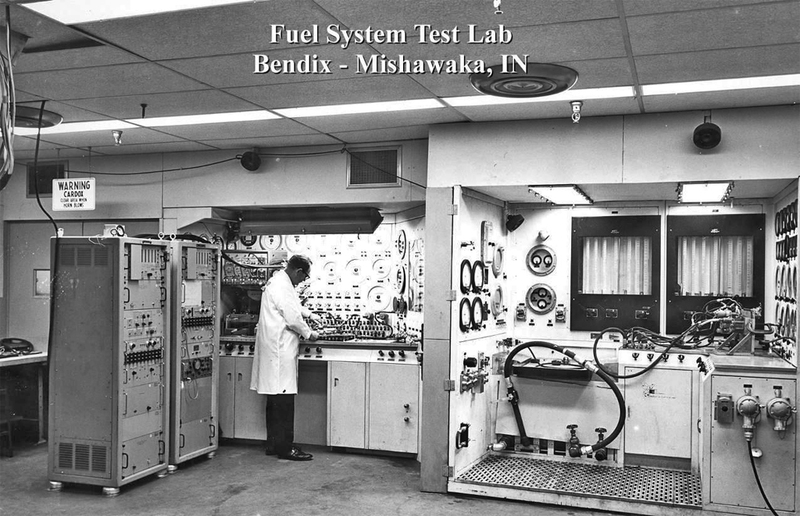 By now the Bendix Missile Division at Mishawaka had become large and pretty much sophisticated with a computer installation and a fair sized System Analysis Group which was doing a lot of Talos flight simulations. I asked if they could do a simulation to understand our Mach number control oscillations. One man became a member of our department and he did a complete mathematical description of our entire fuel control system; weights, areas, spring rates, pressures, volumes, etc., etc., and entered this into the engine simulation and flew the entire Talos on the computer. 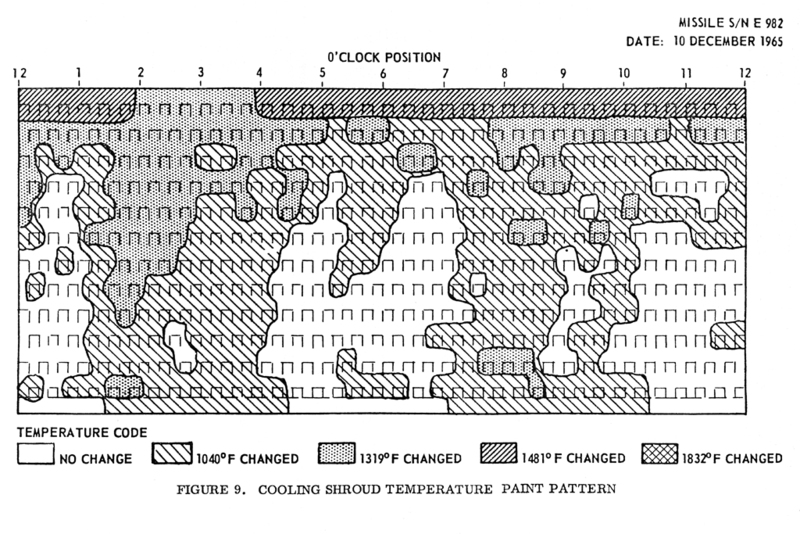 What resulted is that the computer results were identical to what we observed in actual flights at White Sands. 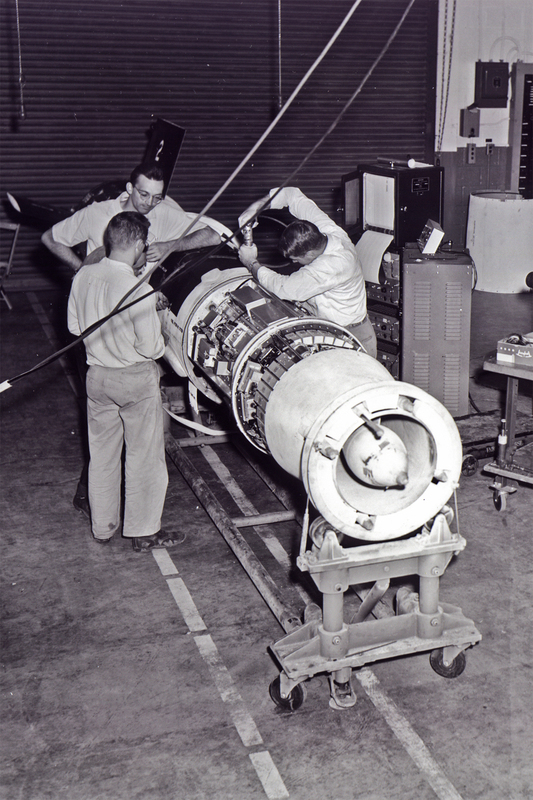 The result was that the axis of the Mach control moving parts on the center line should be at 90° to the axis or longitudinal centerline of the Talos missile. So we made that change on a fuel system and flew it on another test flight at White Sands; and it flew at a nearly constant control Mach number. After that we went from seat of the pants engineers to computer engineers, reluctantly. But we did. The Analysis Group said "it's about time." This is a photo (right) of the fuel control system for the full size Talos. This is the fuel inlet, filter, turbine fuel pump, and main and pilot fuel regulators on each side. This is a picture (left) of a sales display stand with all our fuel control system and hydraulic system components. On the left the curved tank is the high pressure nitrogen tank for pressurizing the Talos fuel tank. On the end of the curved N2 tank is a pressure regulator to control the fuel pressure in the fuel tank. You can see at the bottom end of the N2 tank, the ignition system laid out - with the spark plug at the far left. Further to the left you will see the girl we were all in love with. No, she was not a model - she was one of our secretaries. The Talos fuel tank contained an expandable rubber bag that collapsed when the tank was filled with fuel and expanded when pressurized with nitrogen, thereby forcing fuel out of the tank into the air turbine driven fuel pump. All of these fuel tank bags were made by U.S. Rubber Company in Mishawaka - now Uniroyal I think. U.S. Rubber made a majority of fuel tank liners for WWII fighter and bomber aircraft. I think U.S. Rubber invented the liner and material to make the fuel tanks leak proof when hit by gun fire. Prior to WWII U.S. Rubber was big in rubber products, boots, etc. When I was a kid their rubber boots had a big red dot on them - I think the company was called "Ball Band" back then. 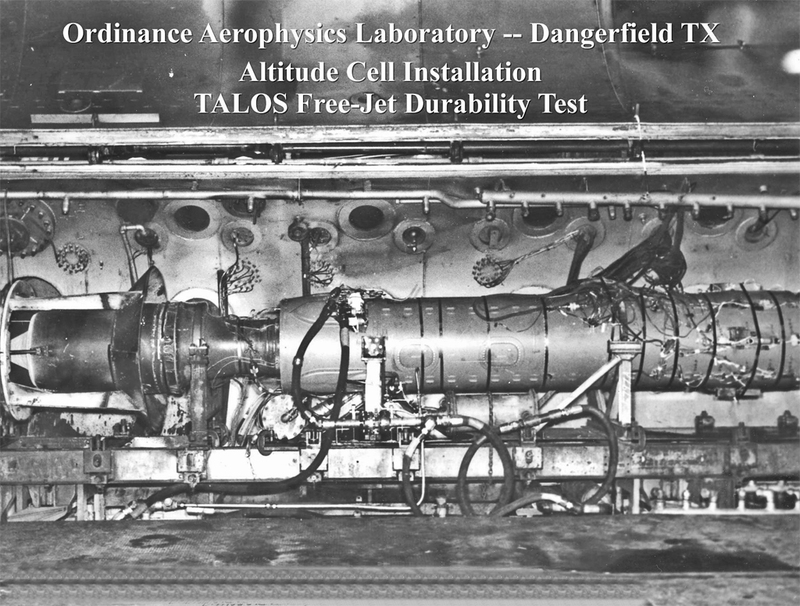 The original Talos fuel was ordinary JP-5 jet aviation fuel. 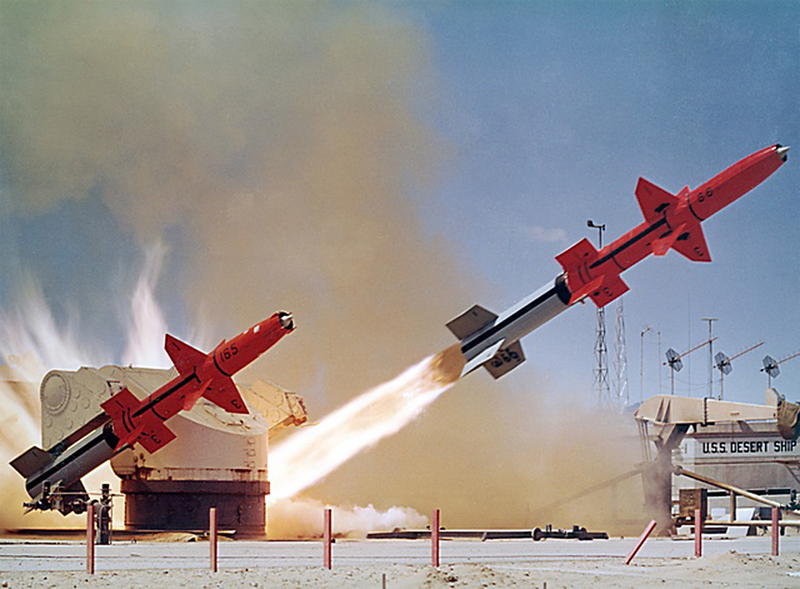 We experimented with higher density fuels to extend the range of the missile. We got several barrels of methylcyclopentadiene dimer (MCPD) at our lab in Mishawaka to check it out. The smell was terrible - I mean awful! We could barely stand to work with it in the lab. It became apparent to us the odor was going to stop this idea. I got just a little on my pants back pocket. I had no idea that a little bit was on my pants. In the open area outside the lab I didn't notice it. Went home that night and walked into the house and my wife said "what happened to you" and chased me into the garage where I took off all my clothes and threw them away - plus taking a big and long shower to eliminate any trace of the odor. The upshot is that we knew that something had to be done about the odor. We were working with ESSO out in New Jersey and I went out there and talked about what could be done. They had another chemical company they were working with, and between them, they came up with tetra-hydro MCPD (T-H MCPD) - the odor of which was acceptable. The funny part of my story is the company working with ESSO was International Flavors and Fragrances. I guess they just poured a little perfume into MCPD. Anyway, the final product was T-H MCPD - and the odor was OK - and it was OK with our fuel system and engine requirement for Talos. T-H MCPD extended the range of the missile from 100 nm to 130 nm. My family (wife and three kids ages 13, 10, 5) watched a Talos launch at White Sands in the summer of 1961 from a set of open bleachers behind the launcher. The firing was controlled from the blockhouse farther back and I was in the blockhouse. They said "It nearly blew us off the bleachers." Security and safety were not fully up to speed at that time. I got the family onto the base because of my security clearance. 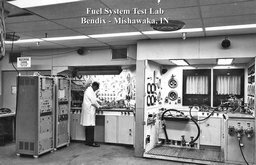 Bendix had a permanent staff and small building on the base at the launch site and worked closely with the White Sands proving ground personnel. Talos people Talos development team. Early Talos prototype Talos prototype development. Vietnam retrofit Retrofitting Talos missiles in the field. The Talos missile system Description of the missile and launching system. 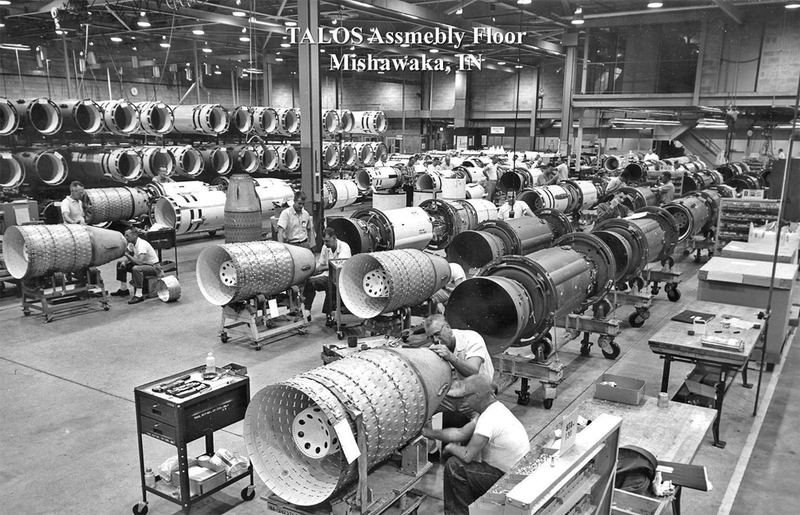 Talos development history History of the Talos missile. 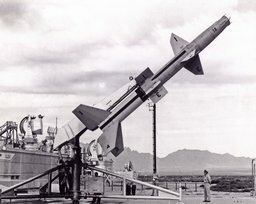 Talos operations Missile operations on the USS Oklahoma City. The Navy's test site building at White Sands was called "USS Desert Ship."